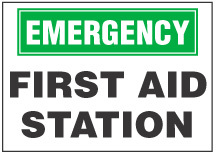 This emergency sign indicates the location of Emergency First Aid Kits. All our signs are available in 3 standard sizes and 3 standard materials. Click here for more info. All our signs are available in 3 standard sizes and 3 standard materials. Custom sizes (virtually any size is possible!) and custom materials including fiberglass, coroplast, dibond, and more, are all available upon request. (PSV) Pressure-Sensitive Vinyl Signs - Just peel off, and press these signs on to your wall or door for a durable, permanent and economical Sign! 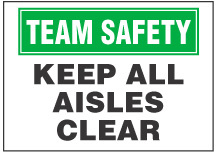 These label signs will wrap around a corner, pole, or any irregular shape. (HRP) Hi-Impact Rigid Plastic Signs - Affix these economical signs to your wall or door for a rugged, long-lasting permanent sign. (ALU) Aluminum Signs - Affix these rugged signs to your wall or door for a virtually indestructible, permanent sign. All signs come with our durable Lamikote finish, which is UV protected, grafitti and tamper resistant. This coating will safeguard your sign for a lifetime! Need a Custom Sign or a specialized material? Email or Call Us Today for Details! Size (WxH): 10" x 7", 14" x 10", 20" x 14"
Copyright © 2019 Idesco Safety Co., LLC. All rights reserved. new product alerts and more - right to your inbox.